Our high-temperature heat pump (WH Series) is a liquid-to-water heat pump with a twist. The WH Series heat pump can use as its source either a typical open loop (provided the entering water temperature does not fall below 45°F (7°C) or, in commercial applications, any clean incoming liquid that has been pre-heated to between 45°F (7°C) and 122°F (50°C). 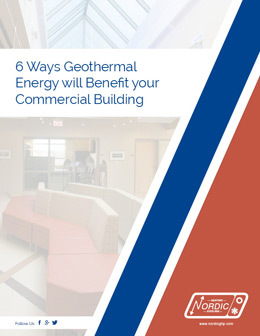 Some heat sources for commercial applications include a buffer tank on the indoor side of a geothermal heat pump or a cooling loop from an industrial process. Using this pre-heated incoming liquid, our high-temperature heat pump will heat domestic hot water to as high as 160°F (70°C). This type of heat would typically be used for heating domestic hot water to 140°F (60°C) or any hydronic heating system that was designed for high-temperature water from a boiler. This heat pump could also be used to provide heat for hot water baseboards. Our high-temperature heat pump is available in residential sizes from two to six nominal tons for hot water baseboard heating, and 7.5 nominal tons for domestic hot water heating. We also offer a version of this heat pump for commercial water heating purposes with sizes up to 32 nominal tons. This version of the WH Series heat pump is used for space heating only and features a coaxial single wall condenser and a rugged, high-efficiency coaxial evaporator. Sizes 150-400 are equipped with braze plate exchangers, the same proven vertical chiller design as our W Series commercial geothermal heat pump. The WH-85 is a dedicated domestic hot water heat pump and features a 316SS double wall brazed plate condenser to meet building codes applicable to potable water. This unit also has a 316SS braze plate evaporator for maximum efficiency. This version of the WH Series is offered in size 85 only, which is 7.5 nominal tons.